Currently listening to Justin Timberlake – Dress On. Welcome to the second week in this awesome year called 2017, so far I’m loving how the year is going and I hope it gets even better for us all as the days go by. One quick question, have you ever considered wearing your skirt as a blouse? Well if you have but don’t know how it make it work, in today’s post I’d be showing you how to style your skirt as a blouse and sharing tips too. Tip 1 : Flared mini skirts are the best when it comes to styling your skirt as a top. This skirt style gives the perfect illusion of a strapless blouse as they create enough room for our breasts to breathe. Tip 2 : Opt for structured and statement yet simple flared skirts to elevate your looking just plain to looking chic. Florals, strips or even something similar to mine with a belt that can be made into a bow are perfect options. 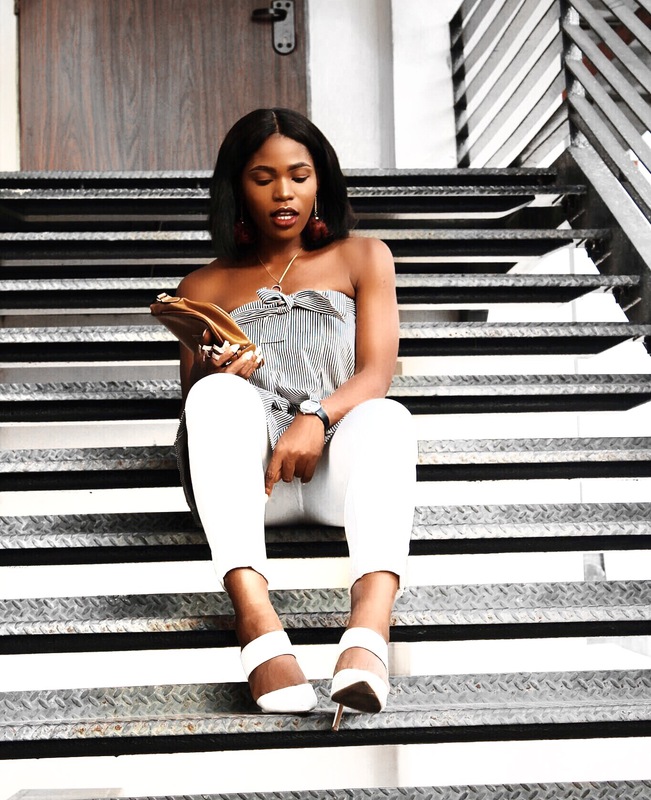 Tip 3 : When it comes to picking a bottom, a well tailored black pant goes with almost every top but I opted for white denim pants because not only do they have a similar texture to my skirt (top), I’m trying to stick with the 3 colors rule (will talk about this later). 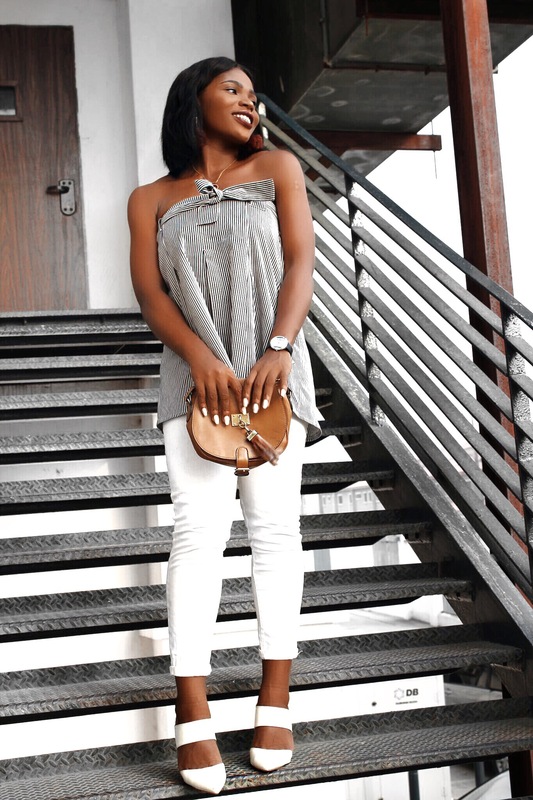 You can also pair this with your regular denim pants for a casual look or a long midi skirt. Note that the skirt option is due to my personal preference as when I tried it with a shorter length skirt I didn’t like the proportions of the silhouette it created, so you can try it with a short skirt and see how it works for you. Tip 4 : As usual, go forth and slay. 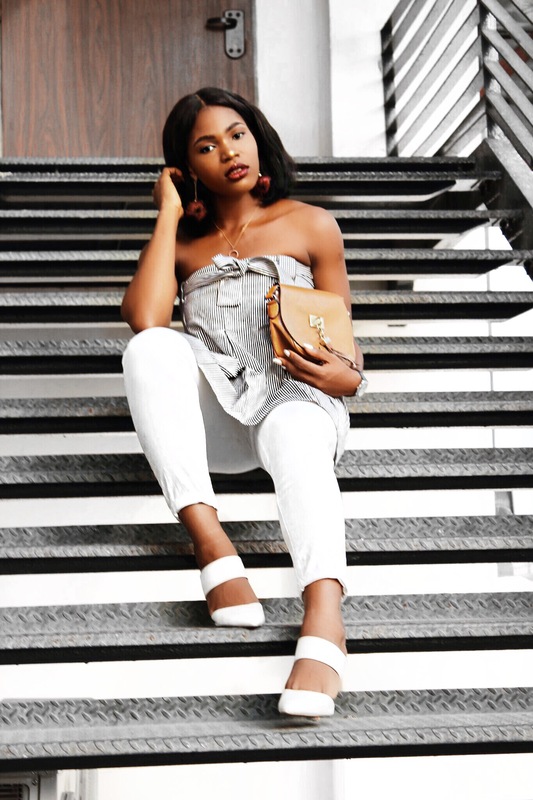 The key to having a great wardrobe isn’t how many designer pieces you own or how your wardrobe overflows, it’s really all about having functional pieces that you can create several looks with. Do have a great week. Word for the day : The only way to overcome your past is to focus on your future. Have you ever tried this? 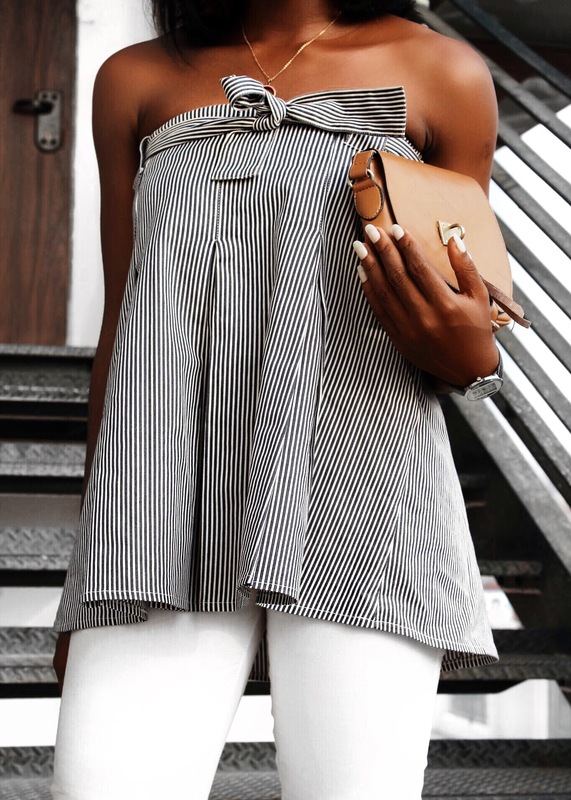 What do you think of this look and do you have any tip on styling a skirt as a top? Do let me know by leaving a comment, thanks. You are looking good dear. I so love your outfit. I absolutely love this look, the color and simplicity is amazing. I actually wore a skirt as a top when I was much younger but the grown up me hasn’t tried it. You should definitely try it again dear and thanks for the kind words. Your outfit looks amazing as always girl! Really lovey. Well put together!!! This is really fantastic ..keep it up sweedy. 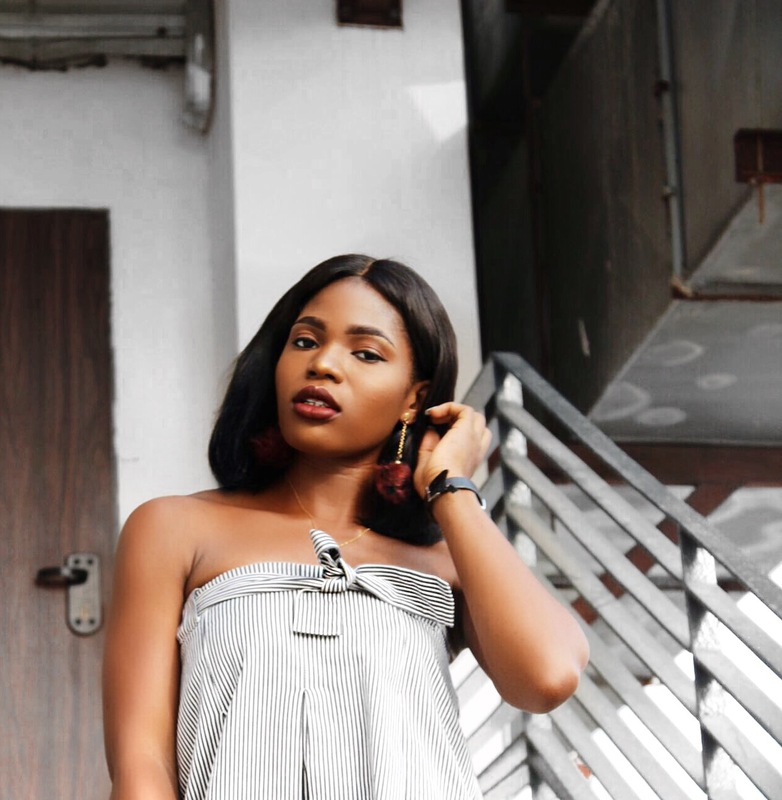 I’m just here wondering where you always get this pieces from😭😭😍😍….I tried this top/skirt thing once and I thought I looked funny…but I’m sure with the tips you’ve given it’ll look much better. I doubt I’d even be wearing it as a skirt anymore lol. Very amazing girl and thank you for stopping by my blog. I’ve tried the skirt as dress trend a lot of times and vice versa, I’m sure you slayed the look. one word…. Amazing!!!!! really, how do you do it? you are just amazing!!!!! I Mean really, sensei, show us the way!!! Hahahaha thank you Vincent, you’re always kind with them comments and I appreciate you. Nice one! Love the creativity. Thank you so much babe, I don’t mind.